It's Made in America week in the nation's capital, ushering in the new tradition at the White House -- business leaders from all 50 states were welcomed to showcase products that are made in America. Among the companies on hand for the event, Stetson Hat Company from Garland, Texas. Stetson began in Philadelphia but moved to Garland in 1938. Stetson has been producing cowboy hats for 152 years. "200 sets of hands touch every single hat, 100 percent American-made, 100 percent Texas, actually," said Justin Thomason from Stetson Hat Company. It's a Stetson tradition to give every president a custom hat. 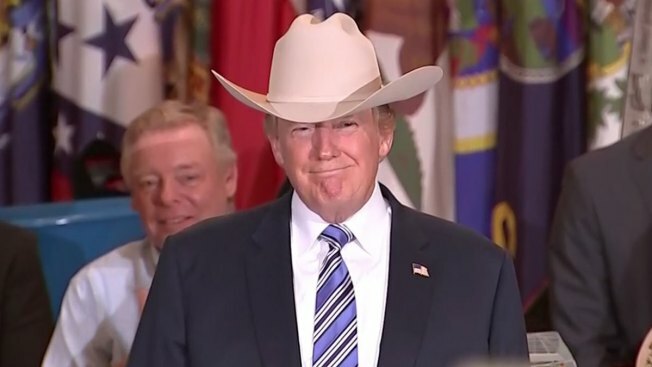 "We have a hat here especially for him, it's the El Presidente, its the General Edition and we had it scripted in the sweatband, 'Donald J. Trump, Make America Great Again, 45th President' and we have the seal as well," said Stetson's Chief Operating Officer Dustin Noblett who hand delivered President Trump's hat. Stetson now employs 400 people and was recognized by Trump, for keeping all of it's operations in the United States. "We want to build, create and grow products in our country using American labor, American goods and American grit," said Trump. President Donald J. Trump signed a ‘Buy American and Hire American’ Executive Order at the White House Monday afternoon. During his speech, the president pledged to wipe out unfair trade practices with other nations, despite some Trump family products that are being manufactured overseas. "Every member of my administration shares the same goal to provide a level playing field for American workers and for American industry," Trump said. "I want to make a pledge to each and every one of you. No longer are we going to allow other countries to break the rules, steal our jobs, and drain our wealth, and it has been drained, it has been drained." Other products on display included DitchWitch trenchers from Oklahoma and Ames wheel barrows from Pennsylvania as well as Gibson Guitars from Tennessee and PING Golf clubs from Arizona.